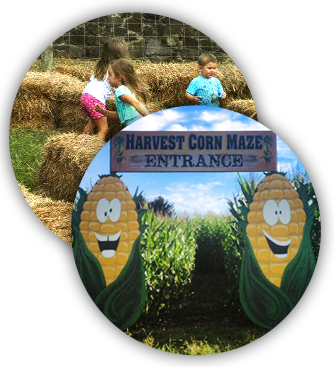 Start a new family tradition at Arasapha Farm’s Harvest Hayride. Visit Pumpkin Garden where your kids will love the pillow bounce, moon bounce the brand new barn bounce and pumpkin jump. Have a blast with the corn cannon. Mine for gems at our all new gem mining experience. Visit with the animals at the Petting Zoo. With train rides, pedal carts, hay bale mazes and more the kids are sure to have fun! But the fun doesn’t end there! Take a hayride down to the Pumpkin Patch to pick your own pumpkin. Or see if how quickly you can find your way through the 5 acre corn maze. Afterwards, relax and grab a caramel apple and hot chocolate at our concession stand or pick up a few festive decorations for your home such as pumpkins, gourds, straw or cornstalks.